7Days is a free Windows 8 diary app designed for those who want to cherish their daily memories by writing them in their diaries. 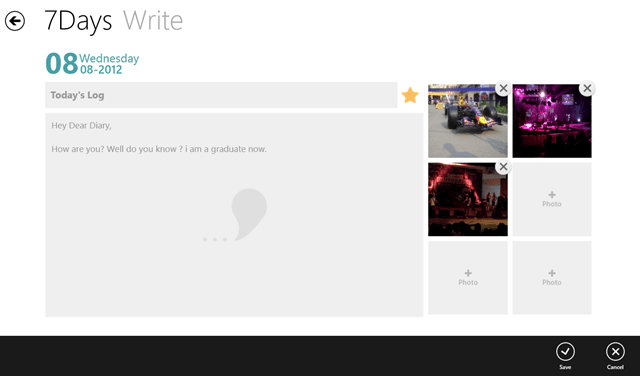 Here, is a cool Windows 8 App for adding your daily memories, your wonderful moments or daily events. But, the best part is you can also add a visual of your wonderful moments. Yes, you are right, you can also add photos to your page. Now, it’s a quite smart way to write your diary entries. No more locks and keys for your beloved book of secrets, now you just have to go to this Windows 8 diary app and just write down each and every stuff you want to remember or just never want to forget for your whole life, whatsoever embarrassing or exciting, just write it down. And you are ready to go. Well, you can easily see that you just have to click on you specific dated page and just write down you diary entry and note down your schedule, write events going to happen, fill it with your cherished moments and stuffs or you can write your nitty-gritty secrets. From the above you can see that, you can easily upload and add photos to your entry and then save it. After that, it will look pretty good huh… What do you say…?? Well, then let me show you. So now, this is how it looks like. 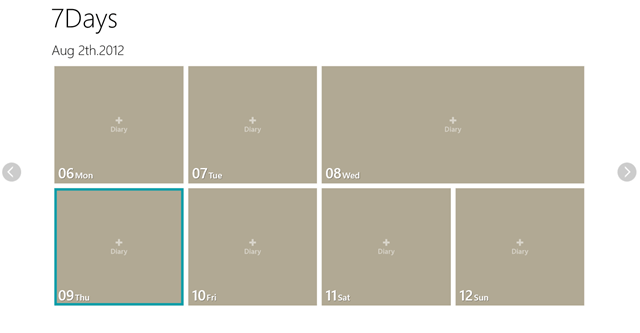 As myself, I really appreciate writing my daily diary and this little Windows 8 app is a very reliable freeware. Give it a try friends, I am sure you will definitely like it. Go ahead and download 7Days given under the “Lifestyle” category of Windows 8 store. Will there be a search function added to this app? Otherwise I like it.